When it comes to employer-sponsored retirement plans, many Americans view them as a monolith, or think that they all achieve the same goal. In actuality, there are major differences between various retirement plans, particularly for business owners. Each type of retirement plan offers different advantages and disadvantages, and is geared towards employers with certain characteristics. What works for a large company with thousands of employees will not likely be a good choice for a venture with a handful of employees — which is why it is so important for business owners to understand the different types of plans available. One proven way to learn more about employer-sponsored retirement plans is through a benefits consulting firm. A benefits consultant has experience with retirement plans and all types of employee benefits, and can offer invaluable advice and assistance in evaluating a company’s unique needs and helping them choose a retirement plan that is right for them. While there are many different types of employer-sponsored retirement plans available, some are simply more popular than others due to their ease of use, lack of filing requirements or cost-effectiveness. Read on to learn more about the seven most popular employer-sponsored retirement plans. Americans spend more time in retirement than ever before, with many people living up to two decades after retirement. This makes it crucial for all employees to have a well-funded retirement plan, and for employers to offer a solid retirement plan as part of a comprehensive benefits package. Employer-sponsored retirement plans have obvious advantages for employees, as it is typically a simple way for workers to save for retirement, reduce taxes and receive additional compensation in the form of contributions to their retirement account. Employers also benefit from these plans, however. Having a good retirement plan can help attract and retain top employees, many of whom consider retirement plans as an indispensable part of an overall employee benefits package. In addition, offering retirement plans can result in tax savings for businesses both large and small. For both employers and employees, retirement plans are a net positive. This type of retirement plan is particularly common and is typically offered by large corporations. These accounts are usually funded in large part by the employee, with monthly contributions deducted from an employee’s paycheck. In many cases, employers will match at least part of an employee’s contributions up to a certain percentage, or provide a flat contribution based on a percentage of the employee’s income, regardless of whether or not the employee makes contributions. In a 401(k) account, an employee is able to direct how his or her money is invested. Employees can typically withdraw or borrow money from their accounts, which may be subject to certain penalties or fees. If an employee leaves a company, he or she can roll their account funds over into a new 401(k) account or an IRA account without being taxed or penalized. Employee contributions reduce an employee’s adjusted gross income, making them tax-deductible in the year that they are made. Contributions are capped each year, with the total contribution limited to $18,000 in 2016. Workers over the age of 50 may contribute an additional amount each year, of up to $6,000 in 2016. Earnings in the 401(k) account grow on a tax-deferred basis. Withdrawals of the investment earnings will be taxed as income upon retirement, with penalties and additional taxes for withdrawal prior to retirement age. 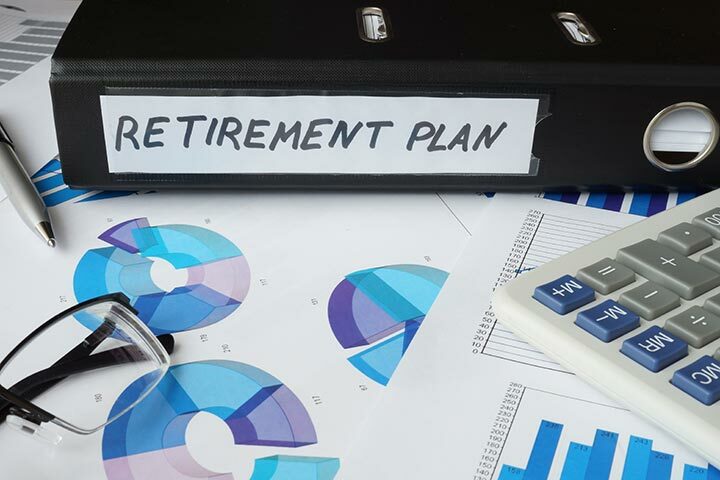 Instead of traditional 401(k) plans, some employers are now offering a hybrid retirement plan that is a mix between a Roth investment retirement account (IRA) and a 401(k) plan. A Roth 401(k) plan allows employees to withdraw earnings on their retirement accounts tax-free. Contributions to the plan are not tax-deductible, but as long as an employee has been in the plan for at least 5 years and is fifty-nine and a half or older, all plan distributions are tax free. Early withdrawals are subject to regular income tax on the investment earnings, plus a penalty of ten percent. Employees can contribute amounts up to the limit for a regular 401(k) plan ($18,000 in 2016). Employer contributions must be placed into a regular 401(k), with the total contributions not to exceed those of a traditional 401(k) plan. The IRS requires that people who hold Roth 401(k)s are required to take minimum distributions starting at age seventy and a half. These plans can only be rolled over into a Roth IRA plan or a Roth 401(k) plan. A 403(b) plan is the functional equivalent of a 401(k) plan, offered for non-profit organizations such as schools, hospitals, home health agencies, welfare agencies, churches and other not-for-profit entities. These plans are funded by both employers and employees, with employers able to match contributions up to a certain percentage of the employee contributions. As with 401(k) accounts, these plans have yearly contribution limits ($18,000 in 2016) and earnings accumulate on a tax-deferred basis. There are also penalties for early withdrawal of funds from a 403(b) account. Like 403(b) accounts, 457 plans are a type of 401(k) retirement plan for employees of state and local governments. They work just like 401(k) plans do, with tax-deductible contributions up to a certain limit, employer matching or flat contributions, and tax-deferred growth of earnings. However, unlike 401(k) plans, employees whose employers offer both 457 and 401(k) plans can contribute to both accounts. This effectively doubles the total limit for tax-deductible retirement contributions. In 2016, an employee could contribute $18,000 to each account, for a total of $36,000 in retirement savings. As with traditional 401(k) plans, 457 plans penalize account holders for early withdrawals; any earnings withdrawn will be taxed as income, and a penalty will be assessed on top of the taxes. Today, pension plans are less common than they have been in the past, as these type of plans tend to be very expensive for the employer. Known as defined benefit plans, they offer a guaranteed retirement for employees: rather than investing in an account that may fluctuate based on the market, business owners are essentially promising to provide a certain benefit for life to the employee (and possibly his or her survivors). In a defined benefit plan, the employer fully funds an employee’s retirement with contributions based on an employee’s income and years of service. The employee will then receive a fixed amount each month. This program is administered entirely by the employer, so that the employee will not have an option to withdraw funds or obtain a loan against the account if necessary. A Simplified Employee Pension Plan, also known as a SEP, is a type of retirement plan that focuses on simplicity for business owners. It is a type of IRA plan, allowing employers to contribute a set amount to all employees, including the business owner. A SEP tends to be an expensive choice for employers because the contribution percentage made to his or her own account must be equal to those made to employee accounts. SEPs are fully funded by employers. An employer has two options for SEP contributions. He or she can contribute the lesser of 25% of an employee’s salary or up to $53,000. Whatever the employer chooses, the contributions must be the same both for his own account and for all employee accounts. For this reason, this option is often offered by business owners with either few or no employees. This plan is a type of investment retirement account (IRA) for employees, known as a SIMPLE IRA. It is typically offered by employers with few employees, as it is relatively simple and cost-effective to administer. For this plan, an employer has the ability to either match an employee’s contributions of up to 3% of the worker’s salary, or make contributions that are not tied to those made by the employee. An employee’s plan contributions are tax-deductible, and capped at $12,500 for 2016. Employees over the age of 50 can make additional contributions of up to $3,000 in 2016 to allow them to “catch up” on their retirement savings. Notably, if an employee participates in other employer-sponsored retirement plans, such as a 401(k) plan, total tax-deductible contributions are limited ($18,000 in 2016). As discussed above, both employers and employees benefit from a well-chosen retirement plan. Employees find that their retirement is well-funded and that their overall tax burden is decreased by contributing to a retirement plan. Employers find that employees are more satisfied and likely to work hard with a good benefits package. They may also have significant tax savings by picking the right retirement plan to offer to employees. When it comes to choosing a retirement plan for your organization or business, there are a wide variety of options, each of which has its own advantages and disadvantages. A skilled benefits consultant can assist you in the process of choosing the best plan for your entity, beginning with an evaluation of your needs, such as attracting employees, ease of administration, low fees and reduced taxes. Based on your goals, the plan can then be selected and customized to ensure that you generate maximum value from your retirement plan. Contact a benefits consulting firm today to learn more about options for retirement plans for your business.